The CEREC system is an in-office restoration machine that mills strong, aesthetically-pleasing crowns in minutes while you wait. This technology makes it easier than ever for patients to discreetly restore teeth to a natural appearance. There are many types of materials that a crown can be made from. At Santa Monica Esthetic Dentistry, we believe our services should be customizable to your specific needs. That is why we offer a selection of quality materials to our patients requiring dental crowns. At the time of your consultation, Dr. Ganesh will work with you to determine what material will be the best fit for you and your goals. 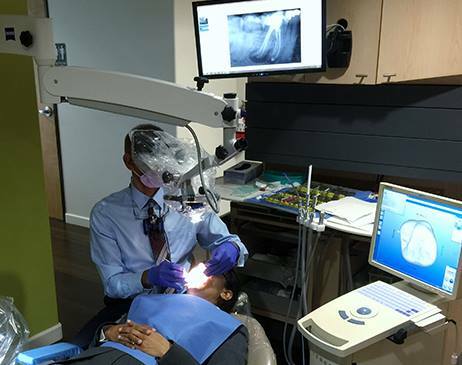 During your visit, Dr. Ganesh will obtain information about your teeth and input it into the CEREC CAD/CAM unit. CEREC accurately matches tooth shade and mills a custom crown in approximately 15 minutes. Dr. Ganesh then bonds the crown to the tooth, where it will blend naturally with surrounding teeth. CEREC crowns are always visually stunning and are more reliable than traditional crowns. Santa Monica Esthetic Dentistry is proud to be a provider of CEREC same-day crowns – a technology that has revolutionized the dental experience for millions of patients. The CEREC CAD/CAM system allows us to fabricate and place crowns all in a single dental visit. In fact, in most cases you can return to your day-to-day responsibilities in no time at all.